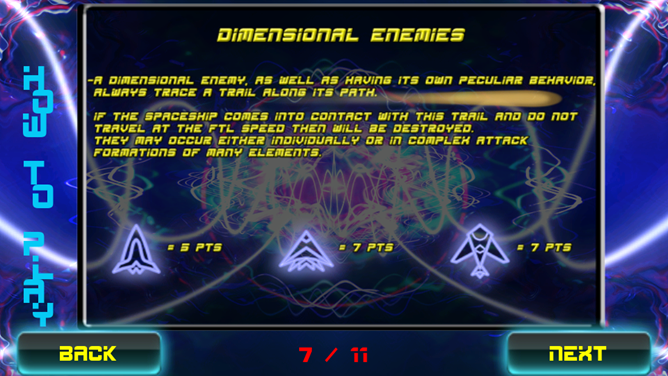 During the past couple months I've seen a growing trend in Android games that seek to emulate the style of Geometry Wars, a highly successful console and PC title. I've had the pleasure of playing both Tilt Arena and PewPew in the past, so why not throw one more into the mix? 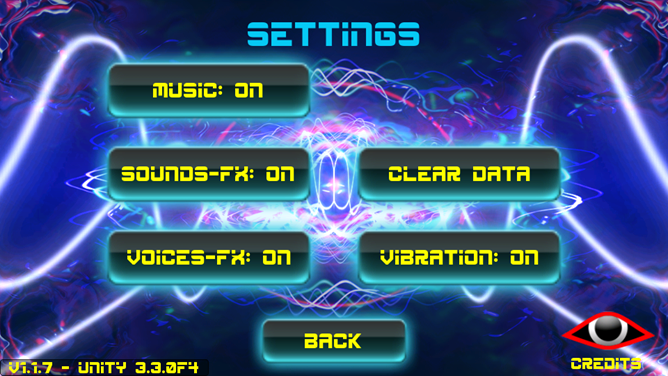 Hyperlight brings another entry into the Geometry Wars-like genre, but with a specific control scheme: tilt controls accomplish everything in this game, and have a deeper purpose than just movement. 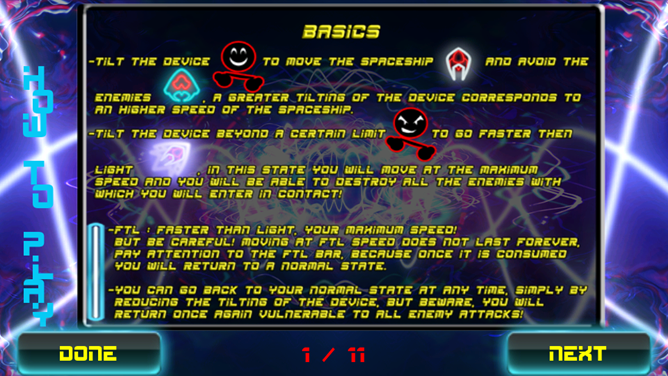 Tilting your phone in all directions influences your movement, and moving past a certain threshold will kick your spaceship into faster-than-light (FTL) mode. While in FTL, your ship destroys (or damages) enemies that it comes in contact with. 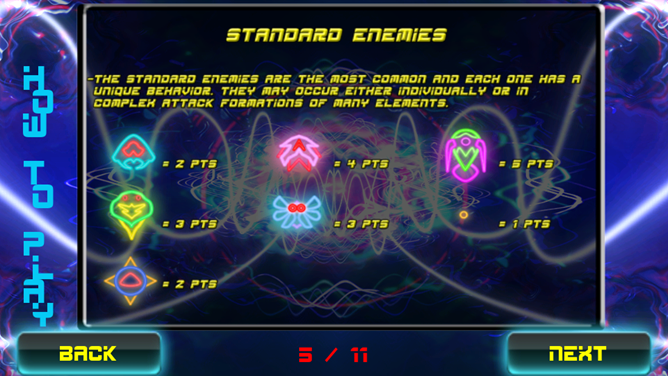 Killing multiple enemies in a row makes a combo meter grow, and results in more points. You can't stay in FTL indefinitely, however: there's a fuel meter on the side of the screen that limits your invulnerability time. 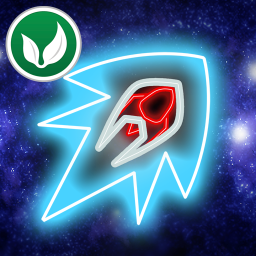 In order to replenish your fuel, you pick up icons that are scattered around the playing field, refilling your meter. These seem to show up with a greater frequency when you're low on gas, but sadly this isn't always true. There have been a couple times where my poor spaceship has been surrounded by enemies, without a way to replenish my FTL meter, which leaves me pretty much screwed. Fuel needs to be carefully monitored while playing, as it depletes faster than you'd think. 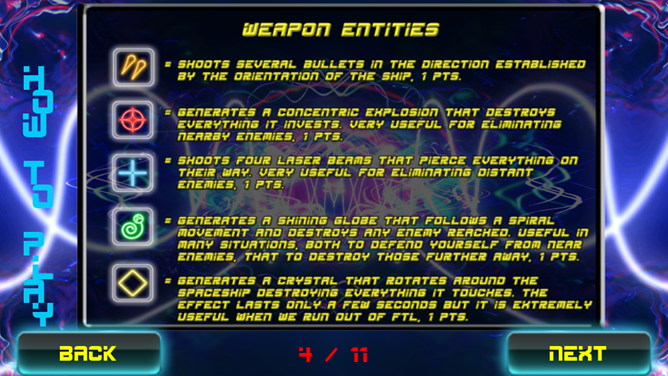 Other power-ups include lasers that shoot from the front of your craft, a cross-shaped piercing laser, an area-of-effect mine, a spinning shield and a outward-spiral orb. These are all activated as you pick them up, which is both a blessing and a detriment: on one hand, you don't have to pay attention to how they're used, but on the other, sometimes they can be easily wasted. 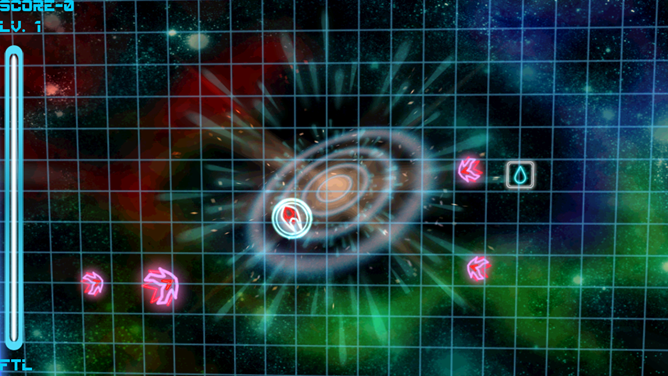 The game is played on a familiar square field where enemies spawn. 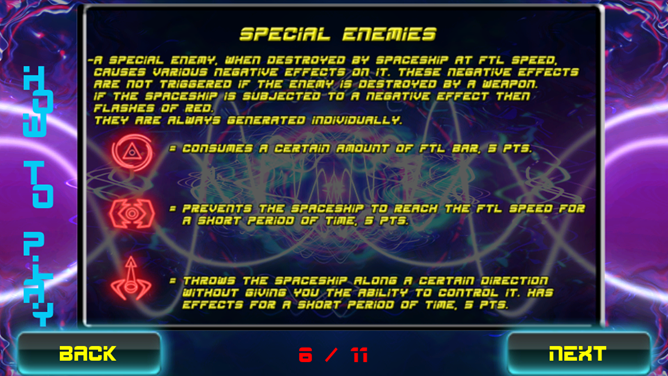 You must kill the enemies, who increase in number and toughness as the levels progress. 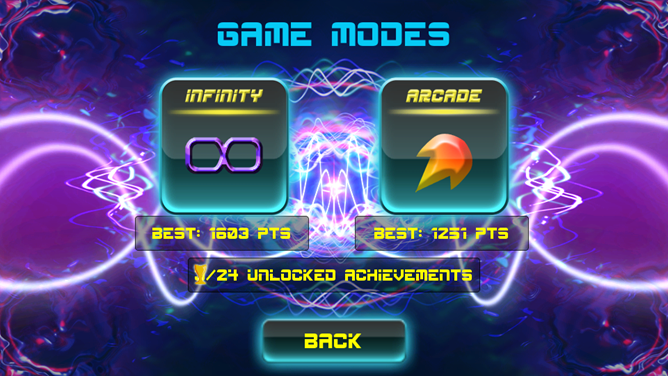 The object of the game is simply a score challenge: your highest score can be submitted online via Feint. There are also a number of achievements you can get, as well. 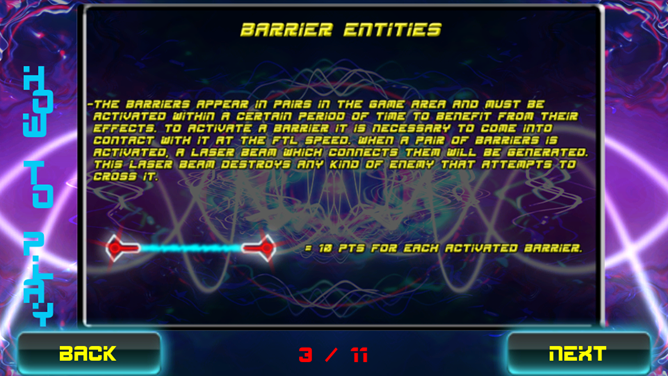 Enemies are generated in different patterns, allowing for easier combos; this also adds a bit of visual flair to the game, as seeing a wave of enemies rushing at you just adds to the excitement. 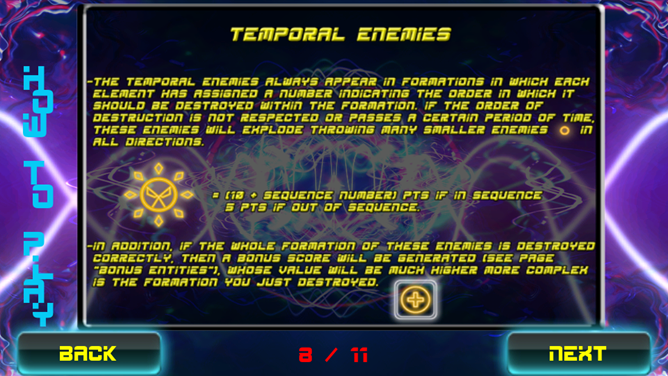 There are different types of enemies that behave in certain ways, along with sub-bosses and bosses that must be defeated using specific tactics. These are all kind of standard fare, as it keeps the game from getting too stale. The addition of other things on the field (like barrier gates that must be flown through at FTL in order to activate them) keep things a bit hectic. Whenever a game makes its gimmick out of touch controls, I get a little bit hesitant. They have to be done well in order to succeed, and Hyperlight kind of straddles the line between "well" and "frustrating." While the "boom" you get from jumping into FTL is satisfying, there have been too many incidents where I'll activate it by accident, or tilt my phone over and over, trying to get it to register that I want to go fast, now. The fact players only have a single life to play with only adds to the frustration, as most of my deaths don't come by accident or poor reflexes: instead, they're from a lack of responsiveness from the controls and the lack of ability to customize them. While these seem like little gripes, you have to understand that the game's entire focus is based on these controls; that there aren't any sort of customization options for sensitivity just seems like a bit of an oversight. 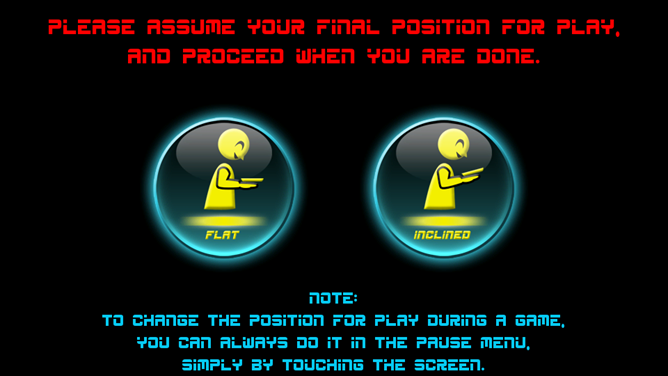 The game does include the option to specify whether you're playing it flat or at an angle, though, which I'll applaud. However, Hyperlight could definitely use a mechanic from another tilt-sensitive game, SpeedX, and calibrate the tilt sensor quickly before every round. This would be a big help, as this game is a bit difficult to play in any sort of bumpy environment. I've found that for best results, Hyperlight is best played completely stationary, sitting in a chair. This is a problem if you're planning to do any type of gaming-on-the-go, like on a subway, bus or train. Besides when I'm reviewing titles for Android Police, this is where I play most of my games. With more people having access to smartphones as a method of gaming, I think that the environment of the player is something that developers should take into account. While not every game can afford to simplify their controls for a gaming-hostile setting like a busy subway, games should at least take into account that they're not always going to be played in a completely sterile environment. 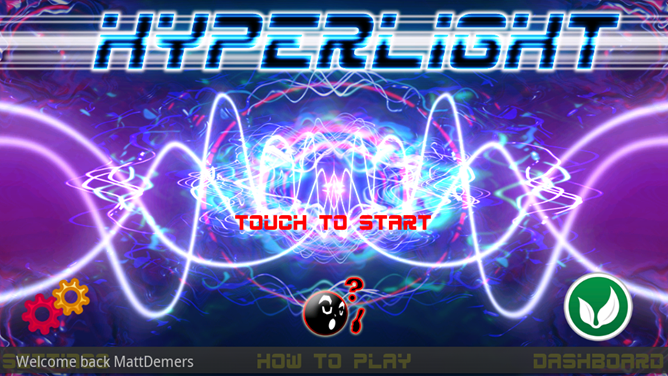 This is a big deal with Hyperlight because if I had the choice between playing it and another game for a few minutes during my commute, I would choose something a little less strenuous; playing Hyperlight is a full-on commitment, and not something you just pick up for a few seconds casually. You have to be sitting down and in the mood to devote a little of your time to getting used to its controls, and in that situation, it shines well. However, in any setting where your attention is going to be split, I'd give it a pass.